On my site you will find recipes and stories from the 1950s and 60s. 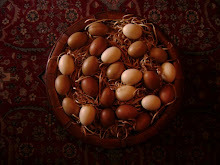 Many of the recipes come from the Polish kitchens of my extended family in the Detroit, Michigan area. Some of the recipes will go forward to my adult life as a world traveller! Everything you find here has been, and always will be, important to me. Enjoy! Meats, cheese, bread, and eggs for Easter Soup. 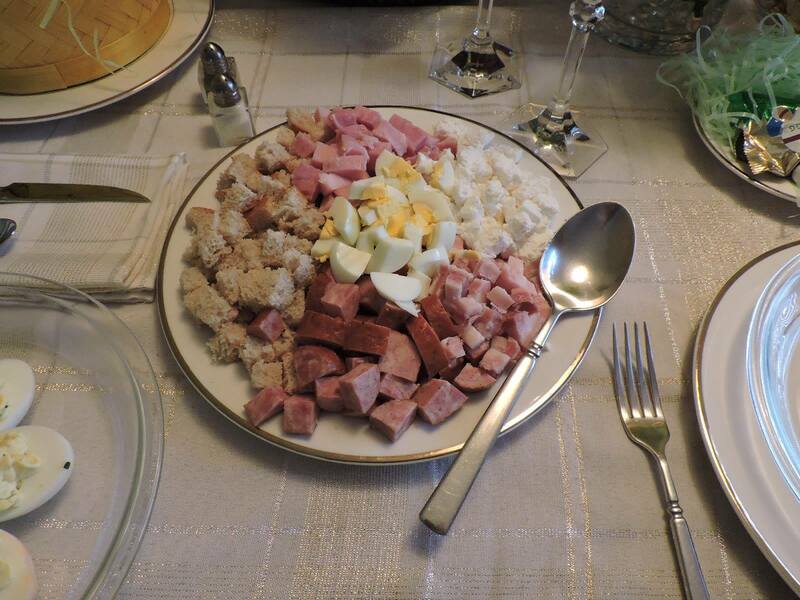 People from Poland probably would not consider this as the basis of an Easter meal, but rather as a meal for Easter Monday--a time to use up the leftovers from Easter Sunday! It is, however, our family tradition because our Polish ancestors in Michigan had to go to work on Monday. It was not a holiday as it is in Poland. In large pot, cook kielbasa with enough water to cover. Cook about one hour piercing skin to release juices. Remove sausage. Reserve stock. In a bowl, fork-blend 3/4 cup sour cream and raw egg with 2-3 tablespoons flour. Season to taste with salt and pepper. Blend 1 cup of warm broth and cream. Blend that into pot of stock. Cook until a gentle simmer. Do not boil (this will cause the cream to curdle). Add vinegar to taste. This soup should definitely be on the tart side so be sure to use enough vinegar. The white barszcz should be served over a bowl of diced ham, the kielbasa from which the stock was made, hard-boiled egg slices, diced farmer's cheese, cubed rye bread, and a little freshly grated or prepared horseradish to taste. I am a retired school library media specialist living in southwest Florida. I spent a number of years working in schools around the world and have lived in Germany, Turkey, Saudi Arabia, and Japan. I enjoy travelling, reading, and eating great food. I especially enjoy the challenge of re-creating dishes that I discover when I read a book. My last creation based on a book was a “Waves of the Danube” cake which was mentioned in "People of the Book" by Geraldine Brooks. It was absolutely decadent and delicious. I have always been in love with cooking and pie baking comes easy to me. I find that baking soothes me in times of stress. The first time I bake something I always follow the recipe exactly to see how it turns out. Afterwards, I will analyze it and make changes if I feel that the recipe could use some tweaking before I make it again. My cooking skills come from my Polish American family roots in Detroit, Michigan and its suburbs. My brother and sisters are all great cooks and they absorbed many of the lessons learned while they were growing up. More of my recipes can be found here! From My Family's Polish Kitchen by Adam Janowski is licensed under a Creative Commons Attribution-NonCommercial-NoDerivatives 4.0 International License.